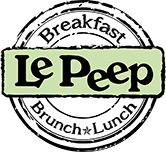 Visit your neighborhood Le Peep® to see how we fulfill our mission on a daily basis. At Le Peep we care about freshness, and quality, and take pride in the fact that our food is prepared fresh daily. We don't do this to be different, We do it to be better! "The food and service.... are excellent! Angela and her employees are doing a great job.... (This) Restaurant is becoming a favorite eating place for many people in the Columbia Northeast area. Thank you."